(BAFTA). EastEnders has received thirteen British Academy Television Awards nominations and has won seven of them. It won the award for Best Drama Series in 1997 and has been nominated for Best Continuing Drama or Best Soap 11 times, winning in 1999, 2000, 2002, 2006, 2010 and 2011. 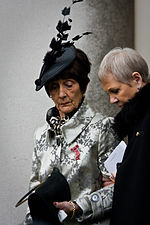 June Brown was nominated in 2009 for Best Actress, the first time a soap opera actress was nominated in this category since Jean Alexander who played Hilda Ogden in Coronation Street in 1988. She was the favourite to win the award, but lost out to Anna Maxwell Martin.